During public comment on this potential change in regulations, James Anderson, general counsel for iGPS, took the opportunity to aggressively push the Green benefits of plastic pallets. The battle between the wood and plastic pallet industry continues to move in interesting directions, with the “Green Supply Chain” now being front and center. Now, the U.S. Animal and Plant Health Inspection Service (APHIS), an arm of the U.S. Department of Agriculture (USDA), is reviewing potential changes in revamping and consolidating requirements for treatment of wood pallets to prevent the spread of environmental pests, such as the emerald ash borer and Asian longhorned beetle. APHIS is considering extending requirements for treatment of wood pallets coming into the US to prevent importation of such pests, using processes such as heat treatment or fumigation with methyl bromide. “We at iGPS believe that substituting plastic pallets for wood pallets wherever feasible would maximize protection to U.S. forests against the spread of invasive pests and deforestation, as well as maximize protection to the environment and the U.S. food supply,” Anderson said in prepared comments to the APHIS commentary meeting in Portland, OR on September, 2. Wood pallets are a major factor in deforestation. Nearly 40% of all hard wood harvested in the U.S. is for pallets. Of these, about two-thirds are limited use, one-way pallets. In 2006, wood pallets used 7.6 billion board feet of lumber, enough trees to cover an area 10 times the size of Manhattan, in just that year alone. Over the past 150 years, deforestation has contributed an estimated 30% of the atmospheric build-up of CO2, a major greenhouse gas. Plastic pallets are a long-life asset – approximately 15 years. On the other hand, wood pallets have a 3-year life, and that’s assuming they are regularly repaired and renewed – which requires the use of additional wood or the cannibalization of other pallets. Plastic pallets are 100 percent recyclable – they are ground and reused at the end of their life, whereas wood pallets present a major waste problem. Indeed, wood pallets amount to about 20 percent of all landfill wood waste. The decay this waste produces includes, among other things, methane which is a significantly more damaging greenhouse gas than even CO2. Should an iGPS pallet become damaged, it will simply be remolded into a new one, thus eliminating the wood pallet "disposal issue." Wood pallets are heavier than plastic pallets, and use substantially more fuel to transport, which increases greenhouse-gas emissions. He also cited reduced risk for environmental pest movement in logistics through use of plastic pallets. Obviously, wood pallet providers, of which there are hundreds, take a very different view. More on all this soon from SCDigest. 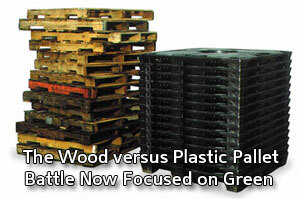 Should Green Supply Chain issues be important criteria in the wood versus plastic pallet debate? Do you think either side has an advantage here? Is this all going a bit too far? Let us know your thoughts at the Feedback button below.